To Dog With Love: Help Us Help Shelter Pets: Santa Paws Drive Donations Now Open! Help Us Help Shelter Pets: Santa Paws Drive Donations Now Open! If you've been following us the past few years, you may know that we're honored to be among the "Elves" to help with Santa Paws Drive, the first-ever online toy and treat drive dedicated to delivering holiday cheer to shelter animals worldwide. In the past four years, the Santa Paws Drive has raised approximately $45,000 in toys, treats and cash donations for 24 shelters worldwide. Wow! That's a lot of donations! And we did it all with the help of pet lovers and brands who have generously donated to the cause. Just a few of the donated toys! This year, Santa Paws Drive is supporting six animal rescue groups that do outstanding work to help animals in their communities. 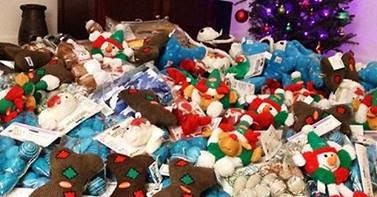 Prior to the official launch of Santa Paws Drive 2013, animal lovers from all over the world sent in nominations for hundreds of worthy animal shelters. Six shelters were chosen based on need and nomination note. Five are in the United States and one is Kabul, Afghanistan. The goal of this year's Santa Paws Drive is to raise $1,000 in cash donations for each one ($6,000) plus enough toys and treats to make sure each animal at each shelter receives a gift. Make a donation (no amount is too small, or too large!) at SantaPawsDrive.com or by using the handy donation widget on our right sidebar. You can donate cash or dog or cat toys and treats. We make it easy so all you have to do is choose how you'd like to help the shelter pets and click to donate! We'll also have a special on-line raffle starting up soon with great prizes you can bid on! If you're a brand, it's still not too late to donate. You can contact our elves workshop and we'll work out the details to help you donate raffle items. 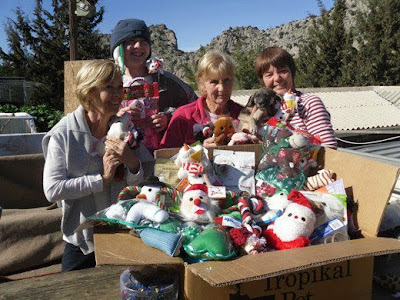 Some happy recipients of 2012 Santa Paws Drive donations! The donations will be divided between the shelters and shipped off in giant gift packages to the lucky dogs at cats at each one in time for Christmas. The last day for cash donations is December 20. The last day for toy and treat donations is December 13, so the Santa Paws Drive elves can have enough time to sort all the items, pack them up and ship them off in time for Christmas delivery! Donations can be made online at SantaPawsDrive.com or on our handy widget on our right sidebar. 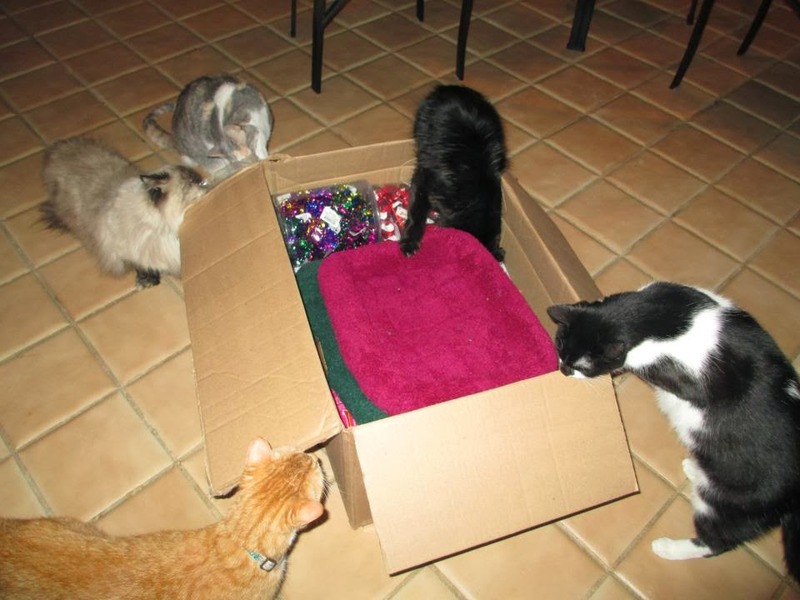 Shelter kitties enjoy receiving their 2012 donation package! We hope you'll join us in helping the anipals who need it most this holiday season! In addition to donating, here are a few more ways you can help just by spreading the word! That is wonderful. We support our local shelter here and actually just donated some food for the holidays.